estate just a few miles SE from the Kremlin. Below: the famous Old Arbat Street, where Pushkin lived and wrote. 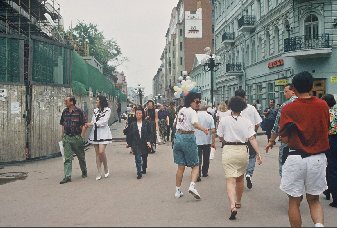 This is in the center of Moscow. MOSCOW: The capital city of Russia, 11 million population. A tremendously exciting city! At times, just plain exhausting. You can go almost anywhere by public conveyance. The world-famous subway, Metro, circles the city and dissects it like spokes of a wheel. Streetcars, buses, taxis, and a growing number of private cars. Airports. Russia's premier university is here, Moscow State. Gorbachev attended MSU. And so did I in summer 1992! The good, the bad, and the ugly can be found here. Old and new apartment houses everywhere, Stalinist Gothic skyscrapers, modern hotels, kiosks, open air markets, apple and cotton-wood trees line the avenues, weeds and flowers everywhere in summer, art museums. Walking, Walking, walking, walking...to and from the Metro stations, shopping, visiting famous buildings and churches and museums and shops, kiosks. Most people live in tall apartment buildings, with no parking facilities. Apartment complexes have big courtyards, and some had play equipment for children in them, but almost all had weeds. During the summer, and almost every weekend, Moscow often loses much of its population to the countryside, where people have little dachas with gardens. They grow produce which they then bring back to their apartments to can or process. Jars of preserved fruits might be around the perimeter of every wall inside the apartment. 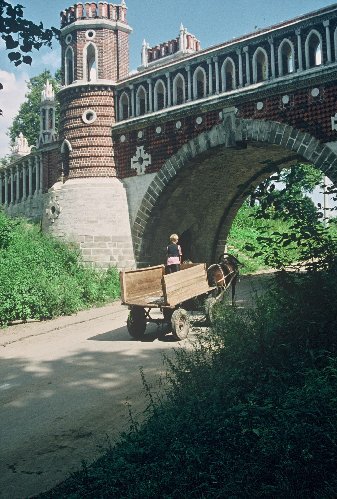 At left is another photo from Tsaritsino, Read more about this estate on the home page.